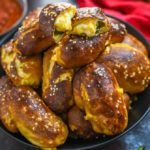 This blog might, in all honesty, solely exist as an excuse for me to make a endless cheese-stuffed or buffalo chicken-covered or bacon-wrapped recipes– to bring my billions of slightly-sinful snack ideas to fruition– and eat them in the name of “taste-testing” on random Tuesday mornings instead of having a balanced breakfast. 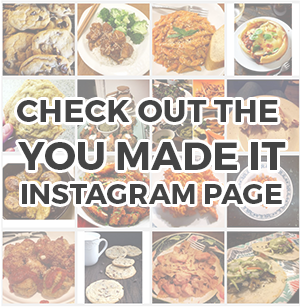 I know it’s not as romantic as saying, “It’s because of my deep passion for the culinary arts!” or “Because I strive to feed my family well-rounded meals and want to share them with the world,” or anything of the sort, but you know what? I’m okay with that. 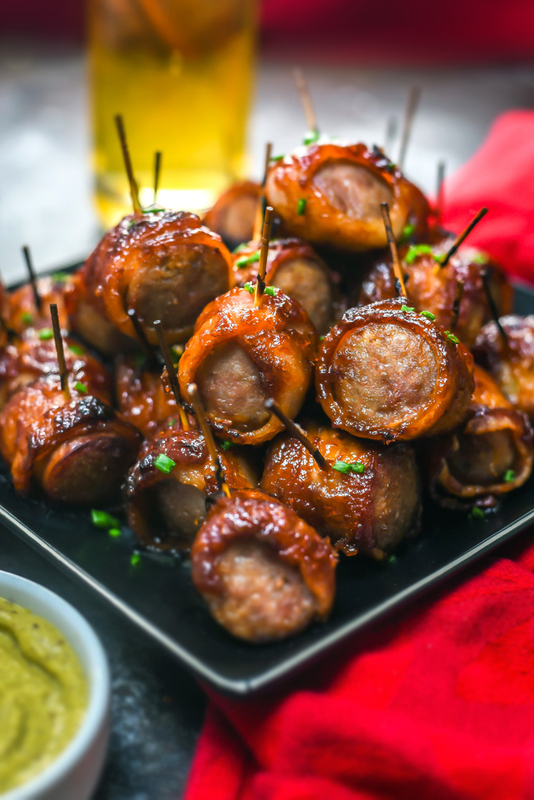 Because in the end, it results in recipes like these 5-Ingredient Bacon-Wrapped Bratwurst Bites being added to my appetizer list and that is a good thing. A very good thing, for sure. 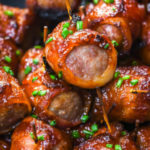 I originally made these Bacon-Wrapped Bratwurst Bites for my homegating party a few weeks ago, and then I made them again for the championship game, and then I made them again so I could take a video of the process, and then I made them AGAIN to celebrate James’ birthday (which is actually today! ), and now we’re eating the few leftover bites at 9AM… and I’m never going to get tired of them. 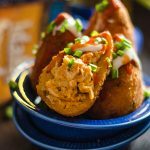 They’re the total package of appetizers: they’re quick and easy to make; they hit all of the sweet, spicy, smoky, salty, and meaty must-have qualities to make them a hit at parties; they’re perfectly portioned into bite-sized pieces; and they only require 5 ingredients. You know I’m going to make them again for the Super Bowl. 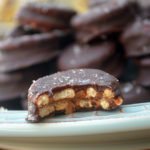 I’m not trying to tell you what to do, but well, I’m telling you that you should make these too. 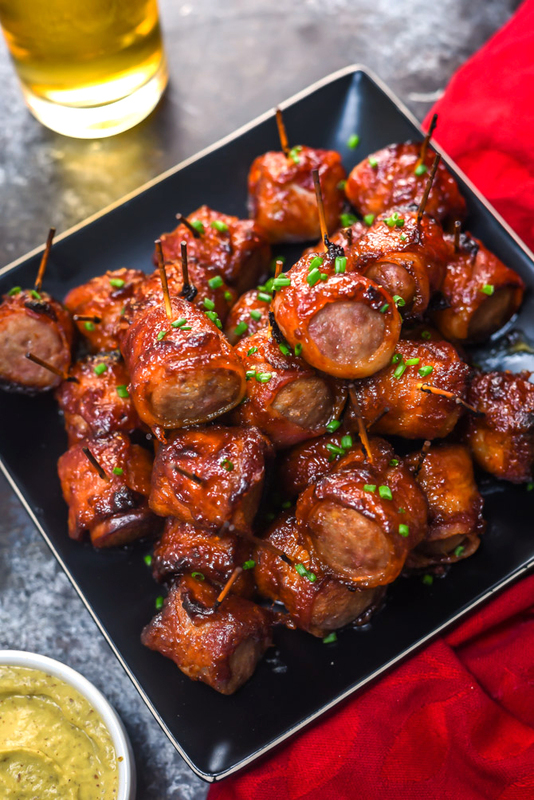 The five ingredients you need to make these bites a reality are beer (whatever kinds suits your fancy), bratwurst, bacon, brown sugar, and chili sauce (the not-super-spicy Heinz version works well, or sriracha if you want them to have more of a kick). I start out by simmering the uncooked bratwursts in the beer. Often times if you simply bake them in the oven, they’ll wind up still being pink in the middle which is no good for serving guests, of course. The beer simmer both ensures that they’ll be cooked all the way through when all is said and done, and it infuses some flavor into the brats in the process. However, if you prefer not to cook with beer, feel free to just simmer them in water or broth instead. Once they’re cooked through, I cut the bratwursts into 4 equally-sized pieces, so they’re just the right size for serving as finger food. This also conveniently makes them perfectly proportionate to the width of the bacon after it shrinks up slightly from baking. After wrapping one bratwurst piece in a halved strip of bacon, I insert a toothpick to keep the bacon in place, which also makes them easy to serve when they’re finished cooking. 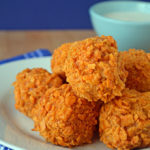 No sticky hands necessary with these bites! The toothpicks will brown a little when they bake with the bratwurst bites, but to prevent them from overly burning feel free to give them a soak in water for 20 minutes to an hour before you use them. Next comes the brush. All I do here is combine equal parts brown sugar and chili sauce and then slather the outside of the bacon in the mixture. 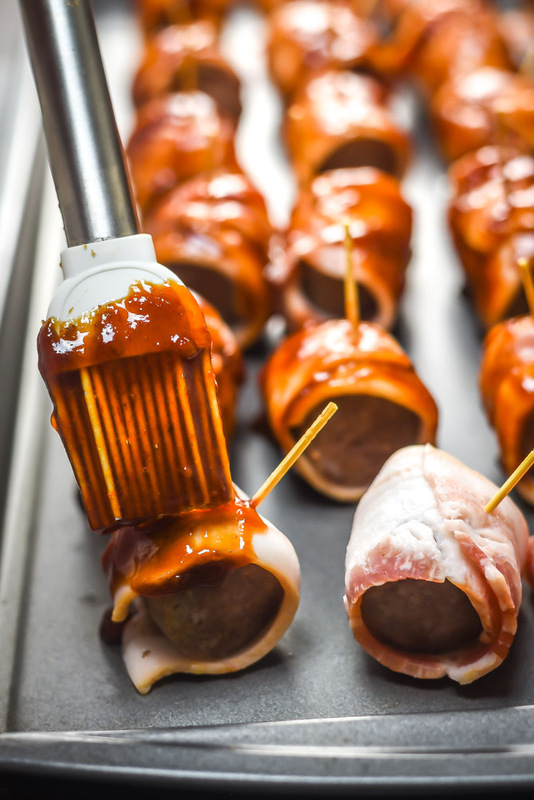 When it bakes, it will form a sweet and spicy glaze which really is what makes the Bacon-Wrapped Bratwurst Bites so addictive. Bake ’em til they’re crisp and the brown sugar has caramelized, and all there is left to do is dig in. 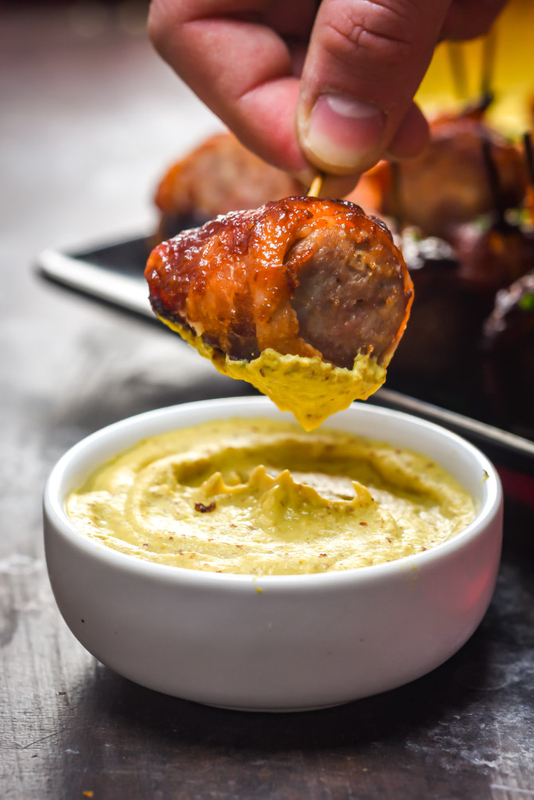 While they’re great by themselves, I like to serve the 5-Ingredient Bacon-Wrapped Bratwurst Bites with a few different mustards, for dipping. Totally optional, but who doesn’t love a good dunk? Place bratwurst in a large pot or deep pan. Pour the beer over the brats and bring to a simmer. Simmer until the bratwursts are cooked through and no longer pink inside, about 10-12 minutes. Remove the bratwursts from the pot, let cool, and then cut into 4 equal-sized pieces. 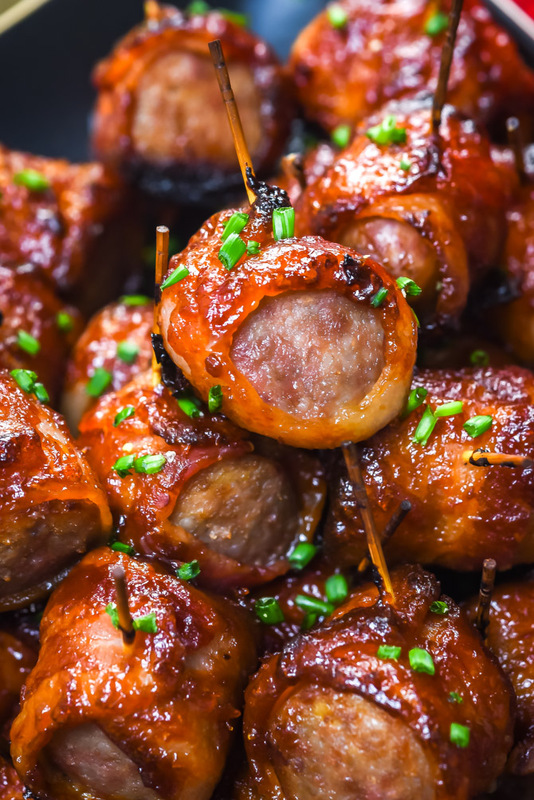 One at a time, wrap a brat bite in a half slice of bacon and secure it in place with a toothpick*. Place the wrapped bratwurst on a baking sheet and repeat for the remaining bratwurst pieces. Set aside. In a small bowl, combine the chili sauce and brown sugar. Brush the bratwurst bites generously with the mixture. Bake until the bacon is cooked and the glaze caramelizes fully, about 20 minutes. Serve with chives and mustard if desired. * To prevent the toothpicks from burning, you can opt to soak them in water for 20 minutes to an hour before using. Hey! I am definitely adding this to my appetizer rotation, it sounds super delish. As a born and raised Wisconsinite, I might suggest being careful of “poking” brats, this process ‘can’ cause the brats to shrink, lose flavor (fat) and even toughen the meat….don’t even get me started on what happens if you buy the cheesy/bacon kind and poke it! I will give this recipe a whirl, thanks for sharing.